Bell’s V-280 is up, flying and rapidly opening the performance envelope toward the next-generation speed and maneuverability promised to the U.S. Army and other customers. Through a 26-year military career flying light scout helicopters then lumbering maritime cargo aircraft, Frank Lazzara ended with 11 years as a CV-22 pilot for U.S. Air Force Special Operations Command. It’s with tiltrotors that his heart remains. He hasn’t flown in it yet, but the object of Lazzara’s aerospace affection is now the Osprey’s high-tech younger cousin, the Bell V-280 Valor. Lazzara narrated a demonstration of Valor’s aerial acrobatics June 18, the first time the media and public saw it fly in person. Valor draws on years of experience Bell has had building the V-22 in partnership with Boeing, but is a clean-sheet design that addresses the Osprey’s shortcomings. The V-280 has a straight wing, fixed-engine nacelles, sliding side doors and a 12-passenger reconfigurable cabin. 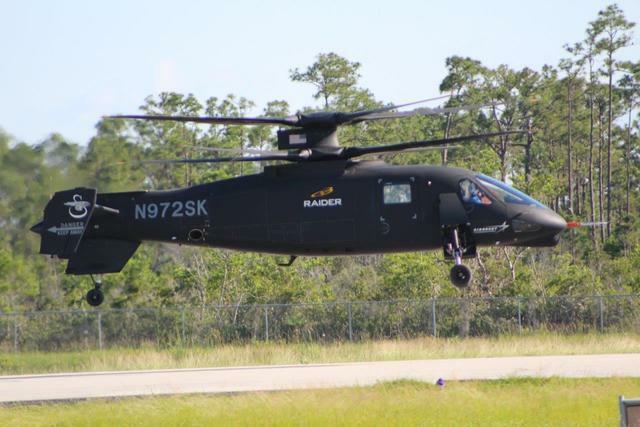 All of those design elements were incorporated in response to the Army’s desire for a next-generation vertical-lift platform with speed, range, payload capacity, reliability and survivability superior to legacy helicopters, Ehinger said. As Valor cruised past gawking onlookers at 160 kt on a bright June day in Texas, its speed was evident. In more ways than one, it’s fast. It zooms at speeds no conventional helicopter can achieve. It also went from “the back of a napkin to a thing of beauty” flying at nearly 200 kt in fewer than five years, said Chief Engineer Paul Wilson. Ultimately, the aircraft should cruise at 280 kt — thus the designation V-280 — and sprint at 300 kt with a 2,100-nm range. Since it first flew Dec. 18, test pilots have expanded Valor’s flight envelope to include cruising at 190 kt at altitudes up to 500 ft. When the aircraft is fully cleared, it will fly more than 250 kt and will be able to decelerate from that speed and land at an objective in vertical mode in about a minute. That’s faster than the cruise speed of the swiftest operational military helicopter, Lazzara said. What’s lost in raw numbers is how this aircraft can dance at 30 ft above the ground. It can pirouette, which combines both lateral and yaw motion. That is not a combat maneuver, but is a powerful demonstration of the aircraft’s stability, especially considering the pilots still are flying in a degraded autopilot mode. So far flight test has been flown in “AUG RATE,” which is the “foundational” level of flight controls, meaning they are hand-flying the aircraft. Even in its most degraded capability, the aircraft still has good handling qualities and is astonishing test pilots with what it can do and what they can do with the aircraft. During a test flight that saw winds up to 20 kt, the aircraft seemed suspended motionless during hover at the hands of test pilot Don Grove, a retired Air Force test pilot with experience in the CV-22. During the June demonstration, Grove and co-pilot Paul “Pup” Ryan, a retired Marine officer, demonstrated a rolling takeoff and roll-on landing, which allows the aircraft to take off at higher gross weights and density altitudes because the aircraft can get on the wing before leaving the ground, taking advantage of the much more efficient wing-lift capability. This maneuver is unique to tiltrotors. V-280 can also take off straight up and transition to forward, airplane-like flight, as the V-22 can, but much faster, and can fly between the two modes at various angles of flight. At full augmentation rate, transition to cruise mode should take about 20 seconds to get the pylons on the downstops and about a minute from a dead stop to get to speeds in excess of 230 kt. 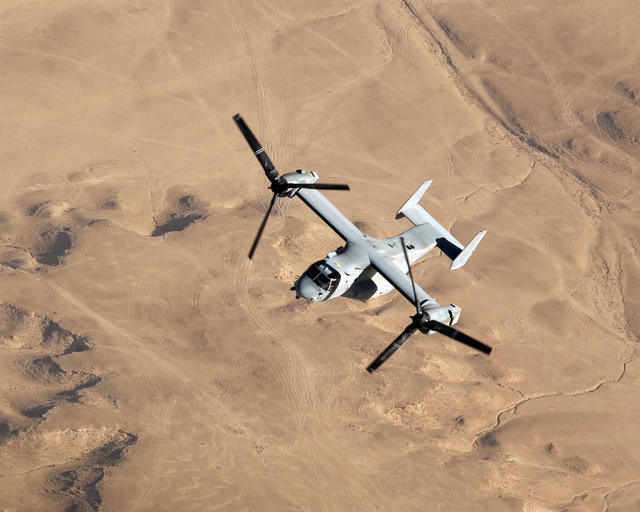 Unlike its predecessor, the V-22 Osprey, the V-280’s twin engines stay put while just the rotors move to create thrust and lift, depending on how the aircraft is being flown. That allows a major operational perk for the Army. Without a nacelle hanging in the field of fire, the V-280 can mount door guns. Because the engine exhaust is directed aft in hover flight, rather than down where it would scorch soldiers, troops can board and exit the aircraft directly under the wing. Low-speed maneuverability is a specialty of the V-280, as demonstrated by its dance moves. When testing is complete, the aircraft will be capable of 45 kt of sideward and rearward flight, Bell said. A perk for troops flying or riding in the Valor: if an engine goes down or is disabled by enemy fire, the crew can keep the aircraft in its safest and most efficient lift configuration all the way to touchdown. It can cruise on one engine operating both rotors, then rotate the nacelles to 95 degrees to provide braking action to slow and stop. It is still an experimental aircraft, but in its young life, pilots have put more than 40 hours of air time on the aircraft. Call it a prototype or an experimental aircraft, but with the V-280, Bell is offering the U.S. Army a vertical-lift platform it can take almost directly into production. Though often referred to as revolutionary, the V-280 is better described as a generational improvement on the V-22, Drennan said. While not identical in any sense, the V-280 was designed and built next to its technological ancestor with eventual production in mind, he said. The U.S. Marine Corps is nearing the end of V-22 production, so there is room in Amarillo to build a new aircraft — or there soon will be. Keith Flail, Bell’s VP of advanced tiltrotor systems, said the company designed the aircraft from the start as a production-representative aircraft the Army could take directly into engineering and manufacturing development, the acquisition phase just before production. 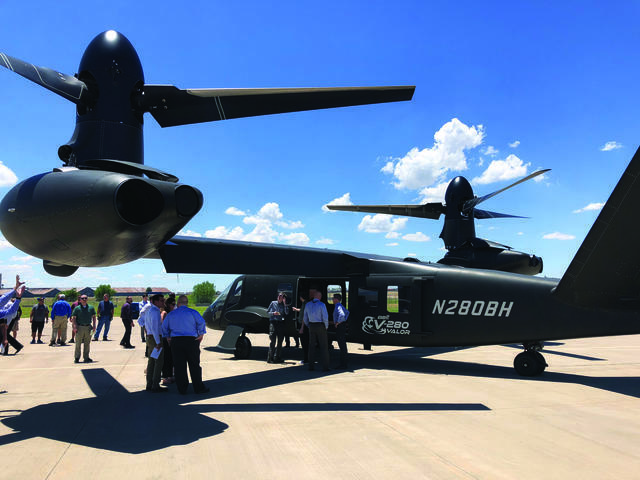 The program has been focused on “burning down risk and informing requirements” for the Army’s Future Vertical Lift family of aircraft, Flail told R&WI during a flightline interview June 18. Army documents lay out the requirements for Capability Set 3 as cruising at between 230 and 310 kt with a combat radius between 229 and 450 nm, an internal payload of between 3,000 and 4,000 pounds and external carrying capacity of 6,000 to 8,000 pounds. V-280 already has flown at 195 kt, and Bell advertises an eventual “dash speed” of greater than 280 kt. The company also estimates a combat radius of more than 229 nm. All of its critical technologies are at or above technology readiness level six, which is required for a milestone B decision to enter engineering and manufacturing development (EMD), Flail said. “That’s the Army’s decision, but our goal all along has been to posture them so they can go into milestone B and they can enter into EMD, should they choose to do so,” Flail said. Bell is not waiting on the Army to continue to improve Valor. There are no plans to build another prototype, but engineers are working to add new capabilities to the aircraft they have. By year’s end, Bell will install a six-camera pilotage distributed aperture system (PDAS) that will deliver real-time full-motion video of the exterior of the aircraft to the pilots and passengers. Test pilots also will continue to increase the level of augmented flight controls they use during test sorties and will begin feeling out the aircraft’s unmanned capability in the simulator, Grove said. The PDAS system, built by Lockheed Martin specifically for Valor, also includes a mission computer to process and distribute the video data. Valor is officially enrolled as a participant in the Army’s Joint Multirole Technology Demonstration Program, which is not a competition but largely an industry-funded exploration of advanced vertical-flight technologies. In that sense, Bell has already achieved what it set out to accomplish — show the Army it can build an operational tiltrotor with advanced maneuverability and performance on a truncated schedule. 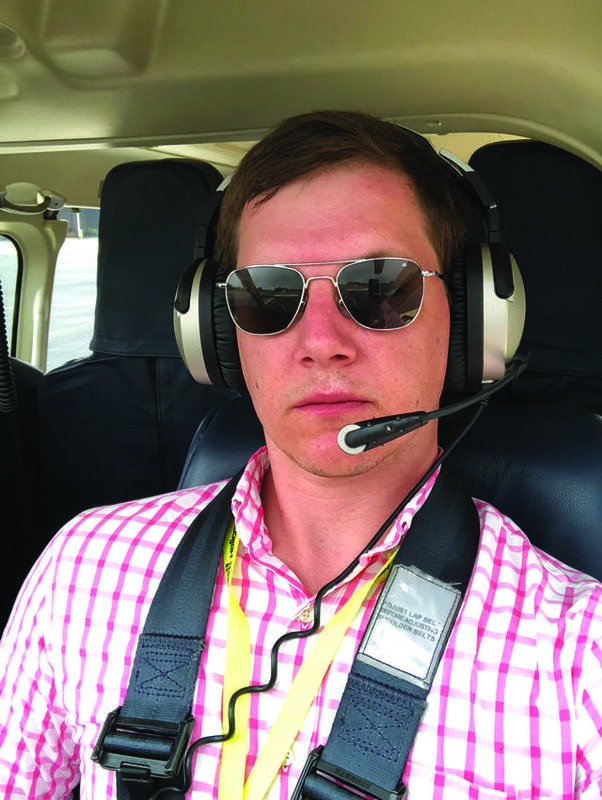 In Palm Beach, Florida, a team of Sikorsky and Boeing engineers is taking a different tack to achieve the same goal. Their SB-1 Defiant coaxial rotorcraft is scheduled to fly this year. Defiant is officially the Sikorsky-Boeing entrant for the JMR-TD program. The Army aims to use the data gathered in JMR-TD to inform its official requirements for the Future Vertical Lift (FVL) family of next-generation helicopters. Both the Defiant and V-280 are aimed at satisfying the Army’s requirement under capability set-3, or “medium” variant that would be analogous to a legacy UH-60 Black Hawk. 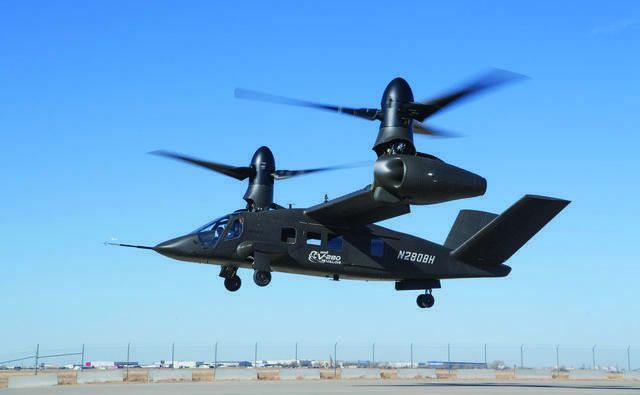 If the Army’s goal is to best the very capable performance of the workhorse utility chopper, Valor program manager Ehringer has a powerful argument in favor of a tiltrotor platform.